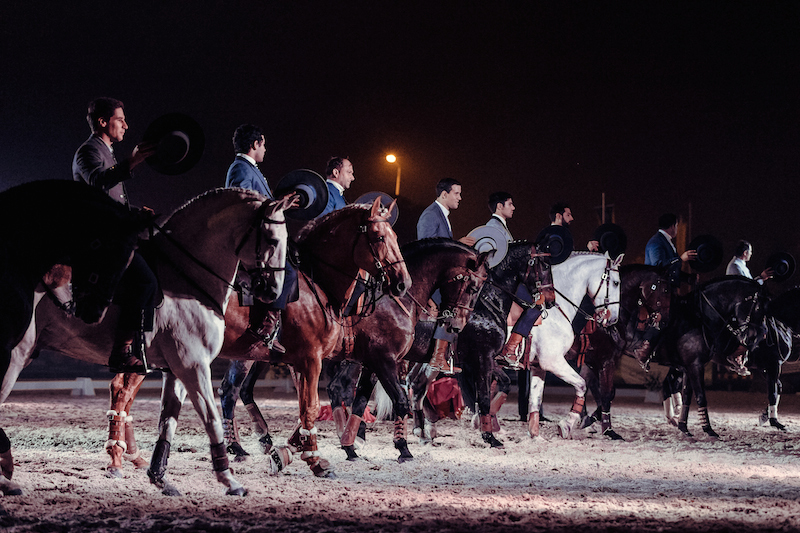 If you love Lusitanos, traditions and a true cultural experience, then the Golegã National Horse Fair is ‘must see’ for you. 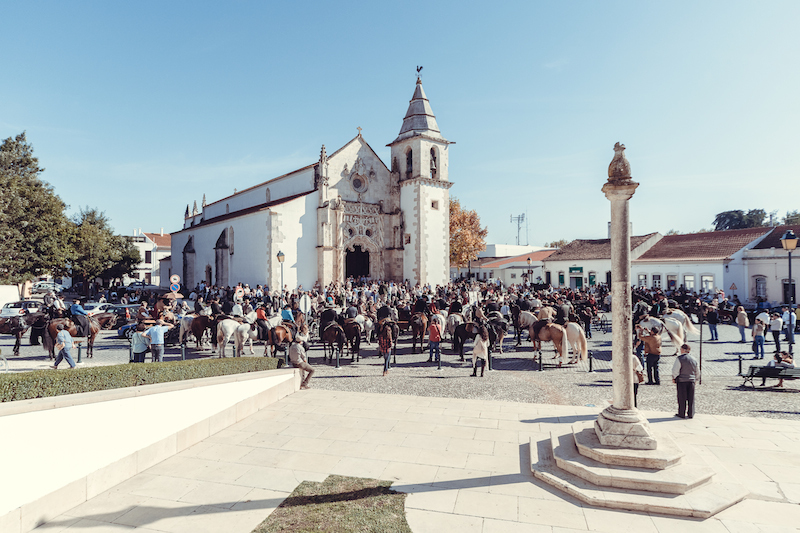 Held in a charming historic town called Golegã, often known as Portugal’s Capital of the Horse, this spectacular annual horse festival is quite literally an unforgettable event. Golegã is comfortably situated between the rivers Tagus and Almonda in Portugal’s Ribatejo Province. This region is one of the country’s most fertile areas, dedicated to growing vegetables and rice and rearing livestock, largely cattle. 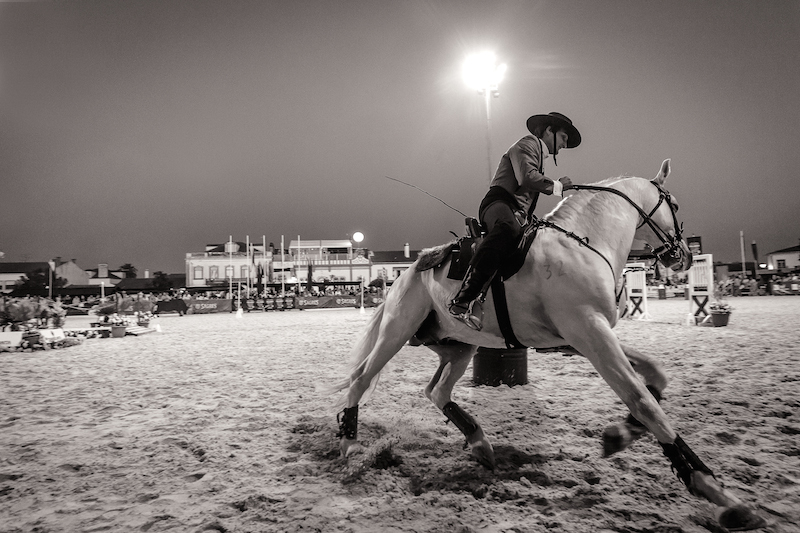 The province maintains many traditions including those of the Campinos (Portuguese cowboys) who are still found working the cattle on the large farms. It is also the home to many of the oldest and most prestigious breeders of Lusitano horses. Golega is the home to many of the oldest and most prestigious breeders of Lusitano horses. Golegã National Horse Fair, originally called Feira de São Martinho, was founded in the 18th century as an agricultural fair intended to promote the province’s ample produce. However, since there were also many well-known Lusitano breeders in the area, they were encouraged to show their horses at the fair. Soon the Lusitano horse became the main attraction. 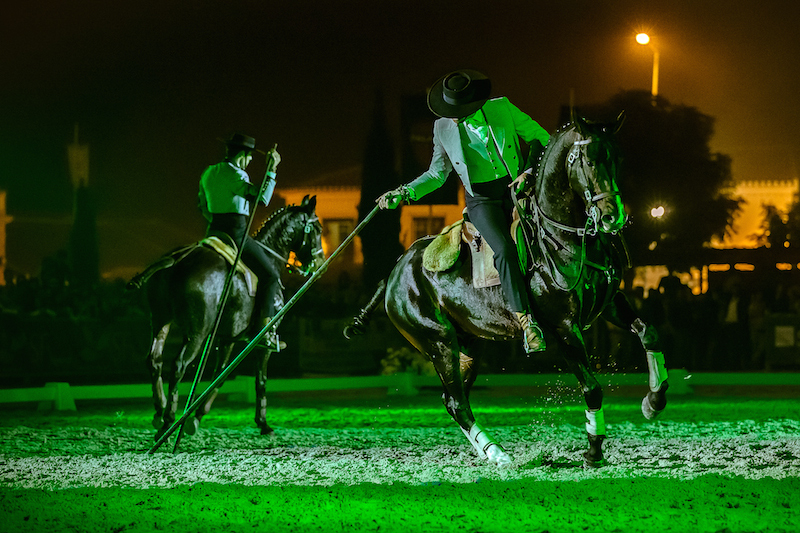 In 1972 the name was changed to Feira Nacional do Cavalo (National Horse Fair), and today the Golegã fair is the largest horse fair in Portugal. Golegã fair is the largest horse fair in Portugal. The Fair is held at the beginning of November over a 10-day period. The dates must include the most important day, 11th November, which is the Dia de São Martinho (the Feast of Saint Martin). On this day, the people eat roasted chestnuts and drink new wine for Magusto, the celebration of tasting the new wines or Agua Pe, and roasting chestnuts. 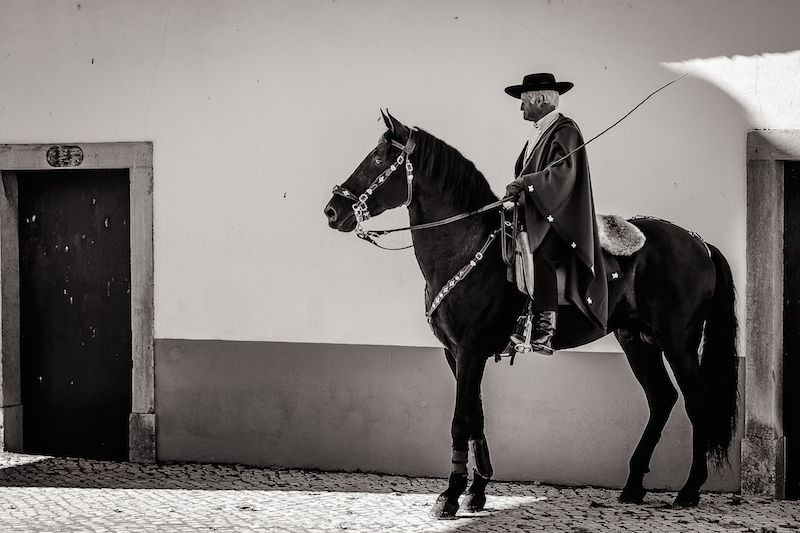 Although most participants in the Fair dress up, on this most important day everyone dresses in the finest traditional Portuguese riding attire. A celebration is held outside the stunning 16th-century church of Nossa Senhora da Concei-ção. During Golega, everyone dresses in the finest traditional Portuguese riding attire. 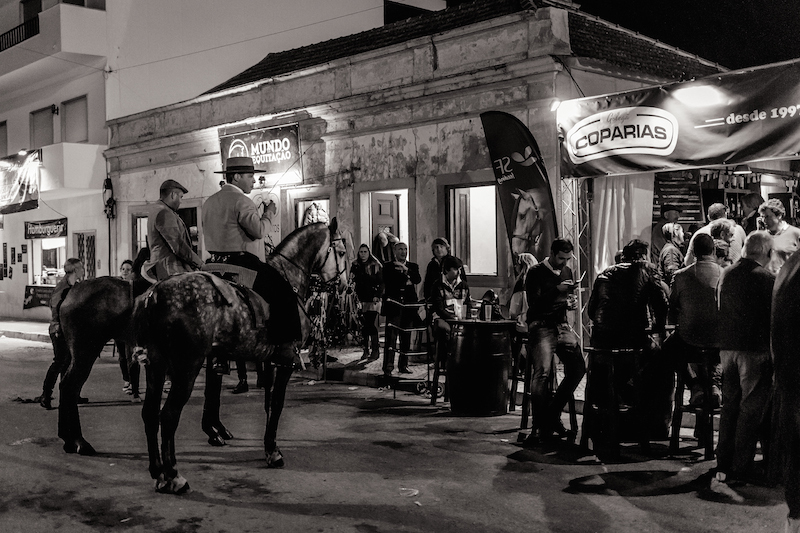 With a unique, almost eccentric atmosphere I’ve not encountered anywhere else in the world, during the festival the whole town becomes a paradise for all who love the Lusitano horse, Portuguese equestrian traditions and to party. It is attracting increasing numbers of visitors every year, both from within Portugal and worldwide. Golega attracts an increasing numbers of visitors every year, both from within Portugal and worldwide. The town transforms from its usual sleepy state to a frenzy of horses, carriages and people. From late afternoon until the early hours of the morning, the streets are packed with people and horses on a promenade. The air is filled with the smoke from roasting chestnuts and barbeque beef and pork, and the sound of Portuguese Fado music, laughter and the clopping of horses’ hooves on the roads. You will find that all your senses are delighted with the variety on offer. Beside chestnuts and barbeque, there’s a wide array of traditional food stalls and restaurants offering rich regional cuisine. Bars, cafes, and discos stay open all the night. For the shopper, it’s a tempting extravaganza of wonderful stalls offering everything from traditional tack, equestrian art, handcrafts, and clothing to quirky battery-powered horse toys for children, and even antiques. 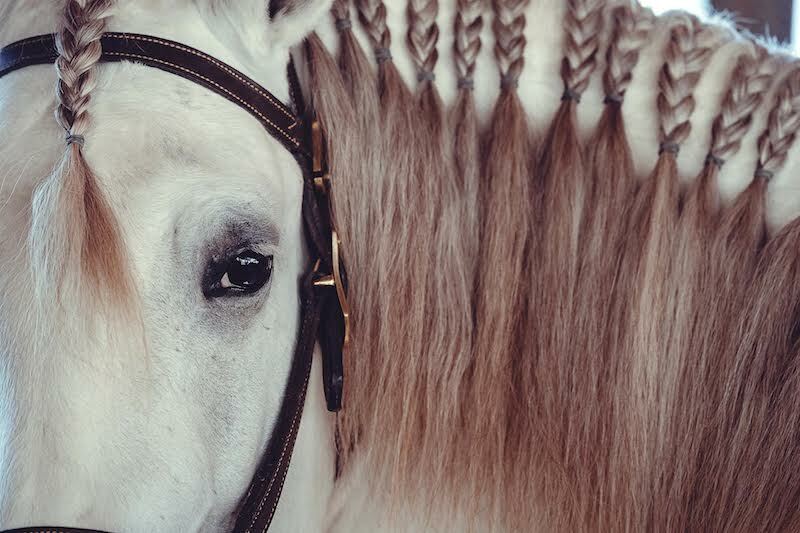 As you weave your way through the streets, front doors of houses burst open and out may prance a stunning white Lusitano ridden by an elegant gentleman. Tiny children on huge stallions perform a piaffe in front of you and carriages pulled by shining teams rush by only centimetres away. You will discover bars designed so the riders can ride their horses inside – 10 riders will be lined up in front at the bar, their 10 stallions unfazed by the closeness of each other and the riders cheerfully enjoying a beer. It’s almost surreal, like being on a film set. I’ve often found myself thinking…Lights, camera, action! In the show classes, you will see some of the finest examples of Lusitanos, in-hand and ridden. You can also enjoy dressage competition, working equitation, and other competitions taking places such as endurance, show jumping and even eventing. 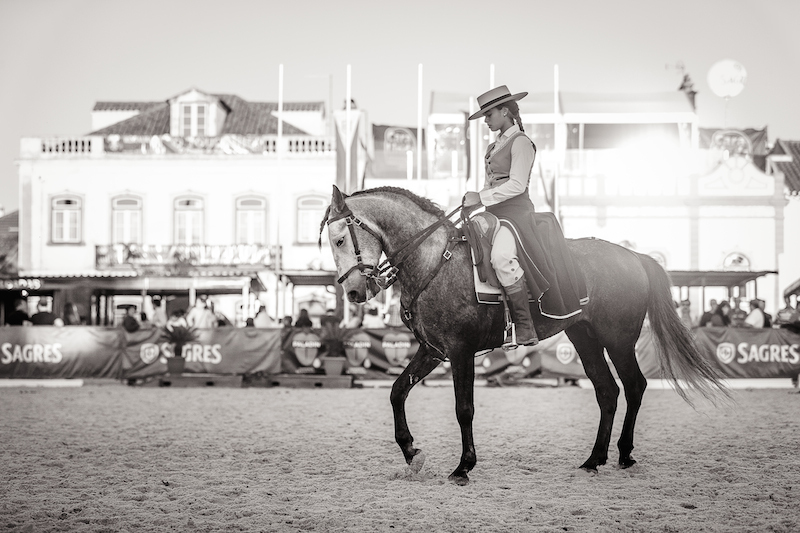 Later in the evening in the centre of the town at The Manga, you can see beautiful classical shows such as those of Mestre Luis Valença, founder of the famous Appassionata equestrian theatre performance, and the riders of the Escola Portuguesa de Arte Equestre on their magnificent bay Alter Real stallions. Expect also to see fast action games of horse ball and parades where prizes are awarded. In the show classes, you will see some of the finest examples of Lusitanos, in-hand and ridden. Situated around the Manga are the Coudelaria (Lusitano breeder) casetas, small wooden houses designed to greet guests, offer wine and serve olives, cured meats and other regional party foods. Here you have the opportunity to meet the breeders, many of whom are multi-generational with bloodlines going back hundreds of years. Alongside each caseta examples of the breeder’s Lusitano horses are presented in stalls and are sometimes also offered for sale. Although horse buying goes on throughout the fair, it is advisable to organise appointments to try out horses early in the day rather than in amongst the crowds later on. Buyers may also prefer to see horses at the fair and then if interested visit the stud farm later in the month. Alongside each caseta examples of the breeder’s Lusitano horses are presented in stalls and are sometimes also offered for sale. In these modern times with everything moving on so fast, I feel it is both refreshing and energising to visit a cultural event that is still able to embrace tradition and indeed value it so highly that the experience still feels authentic and full of the spirit of life. 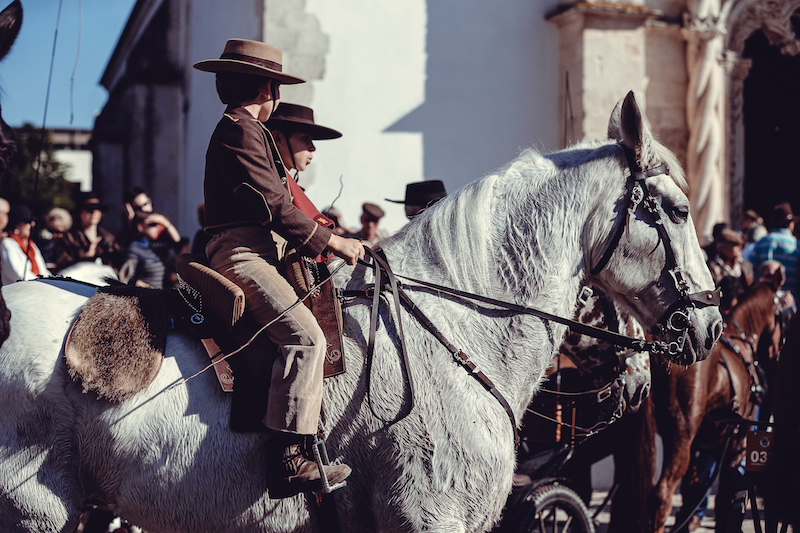 With all it has to offer, best and worst, the Golegã National Horse Fair is an event you really should have on your list of things to experience. Golegã has played an important part in Portugal’s heritage due to its strategic proximity to the for-mer Estrada Real (Royal Road). Interestingly, the name Golegã was derived from a guesthouse opened in the 12th century by a Galician woman, which resulted in the village being known as Venda da Golegã (Village of the Galician). Over time, the name has evolved to its present day name of Vila da Golegã. The old town is filled with artistic and historical heritage, with many fabu-lous churches, chapels, museums, manor houses, and the Natural Park of Boquilobo’s marshlands, which are certified by UNESCO as a biosphere preserve. The park is certainly worth a visit, as is the nearby beautiful historic town of Tomar. Golegã has played an important part in Portugal’s heritage due to its strategic proximity to the for-mer Estrada Real (Royal Road). Getting accommodation at Golegã can be difficult due to the limited accommodation and the large numbers of visitors. We recommend that you plan and book well in advance and there is no such thing as too early…many lodgings are booked at least a year in advance. Teresa Burton owner and founder of Lusitano Horse Finder. At the 2015 Golegã fair, we were very fortunate to meet the outstanding equine photographer Christophe Taniere in our Lusitano Horse Finder Golega Studio. 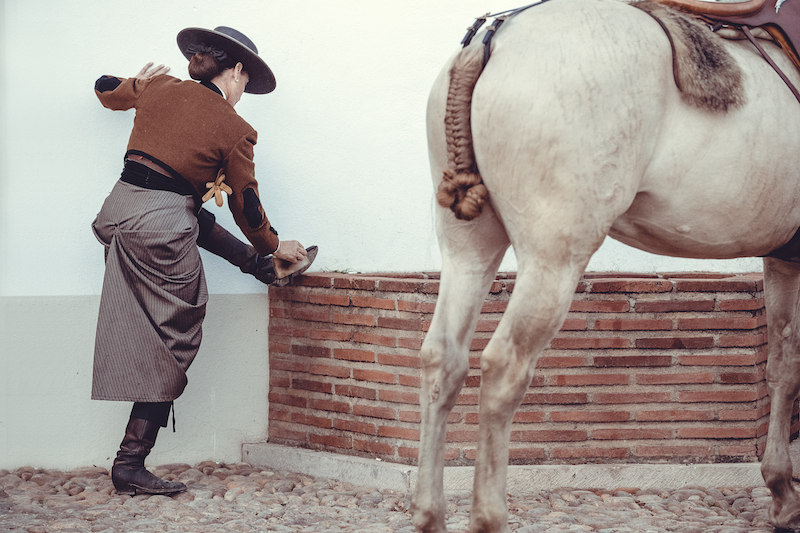 Our instant connection created a fun opportunity to bring Lusitanos inside the door for a photo shoot. 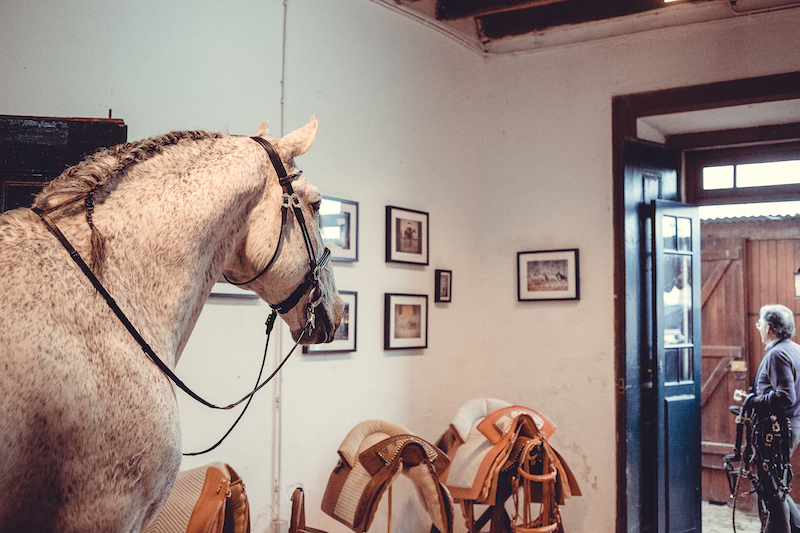 Lusitanos amongst handmade tack and artwork…what a great combination.